Hope everyone had a lovely weekend? This weekend went by so fast. My life as a graduate student begins again this week after a long break. Thanks to imjustmefashionblog.blogspot.com & www.shoecentrics.blogspot.com for the "Stylish Blog Award". The rules ask that I write 7 facts about me and also pass on the award to 15 people. I am very ambitious--always aiming for perfection. Congrats!! Your outfit is hot :). LOVE the skirt..and the entire outfit! I loved the skirt and that shoes are so cute! ahhh you look so cute! I especially love that bag! Very very hot! You're one stylish lady. look at those SHOES, they're to die for! Love how you paired them with a more career-focused look. Great skirt too. i can love more your outfit. That skirts!!!!!!!!!!!! you look so pretty! i'm in love with your skirt!just perfect! OMG!You look so pretty and what can I say:perfect! I see You are ambitious I can see that in your outfits! And I adore your facts ~ I am the same on #s 1, 2 and 6! Tanks a lot for your message!!! Love your outfit! the skirt is so nice! KILLER HEELS - love it! Thanks for stopping by. Love this outfit! And those shoes are hot!! Thanks for the comment on my blog! Follow each other?? Those are some very nice heels. Ohhh, MAN! 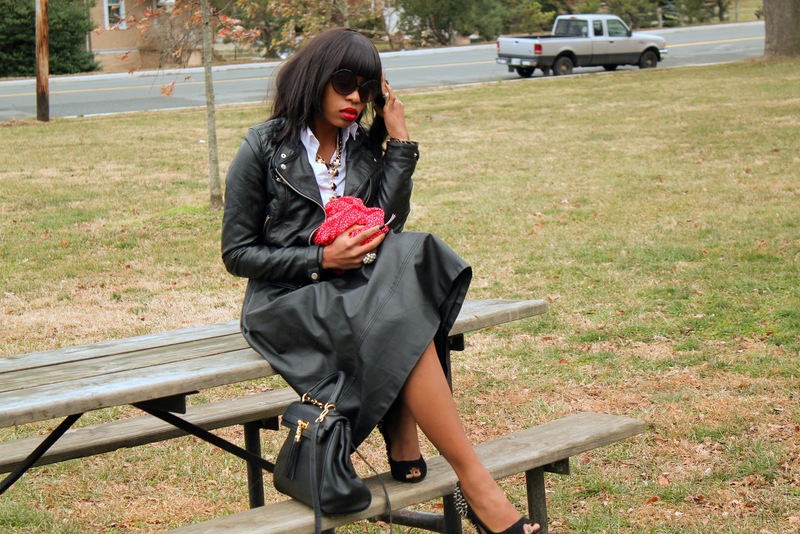 This leather skirt is the best I have ever seen! I LOVE IT! too hot for words! wow! u look amazing..luv the shoes!!! i think i've said this before but.... i still love your shoe!! lol love the double leather look too, the scenery is great!